Awakening: The Blood Rock Prophecy How can you be honest with others, when you can’t even be honest with yourself? Are some secrets worth keeping, even in the face of death? A prophecy, once thought improbable, comes to the surface. An ancient rivalry and damning legacy quickly make their presence known, forcing two young friends to escape to the White Mountains of New Hampshire. Can their new friends, part of the Abenaki tribe and Rowan Coven, provide them with the answer they long for? Who will survive the disturbing magical reality of being witches and the coming of age of two strong-willed teenagers? Losing the Plot in LA Sylvie is a trendy, LA party girl with more going on than she knows what to do with. Between apartment hunting, insane friends, a rapidly growing puppy, and one too many boys to juggle, she’s just trying to catch her breath. Will the craziness overwhelm her, or will she find a better path to move forward? Draw a bath, pour some bubbly, and join her as she tries not to Lose the Plot. Out & About Dad: My Journey as a Father with all its Twists, Turns, and a Few Twirls Out and About Dad chronicles my personal journey as a father, raising my children in what was at the time a very unconventional home. It’s a raw and honest portrayal of life as a gay father back in the day…the only sugar coating is on the gingerbread houses we made one year for Christmas.It’s not easy for any parent; we all struggle in our own way. But when I was going through a divorce, coming out as a gay man, and being a primary caregiver for my children, there was no one out there telling our story. There were no role models, no support groups, and no hashtags. While I tried to “do it all,” I couldn’t force it to work. I eventually embarked on a different way of life, a journey to find happiness for my entire family. I was a Single Gay Dad (SGD) long before it was accepted, popular, or dare I say embraced like it is today. Life as a SGD was met with a lot of resistance not only from places you’d expect but also from those I thought would support me. After a lot of convincing from a friend, I decided to write my story. It’s a story of understanding self, knowing what you want out of life, and doing what you need to do to make your family happy. I hope this book helps others knock down the barriers that hold them back, cast away hurtful judgments from others, and have the confidence to embrace change. I hope it inspires people to live life on their terms. April the Aussie Everything changed when the Megans adopted an Australian Shepherd named April. Through the ups and downs, laughter and tears, April forever cements her place as a member of the Megan family. This is a heartwarming story that will make you laugh, cry, leave you in suspense, and resonate with every dog lover. Are We There, Yeti? Tibetan Mastiff Hoss encounters a lost yeti in his village and embarks on an adventure to return the baby to the top of Mount Everest. 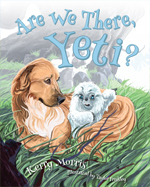 Join Hoss and the yeti while they meet exotic animals, overcome obstacles, and explore the Himalayan landscape! 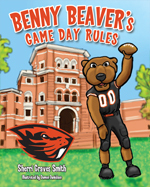 Benny Beaver’s Game Day Rules Come along with Benny as he takes you through a game day filled with fun! Along the way, Benny teaches manners and good sportsmanship in the traditional Oregon State way! Born to Be a Bulldog Have you ever wanted to be part of something big? Something bigger than yourself and your family? 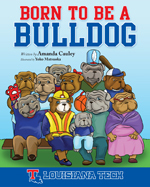 Join Baby Bulldog as he discovers that he is part of an even bigger Bulldog Family. 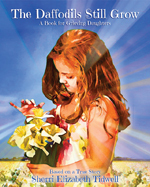 The Daffodils Still Grow The Daffodils Still Grow is a full-color illustrated book that portrays life after a loved one dies as seen from the observations of a motherless child. 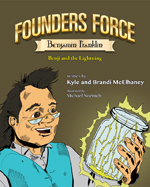 Founders Force Benjamin Franklin: Benji and the Lightning Founders Force is a team of American heroes tasked with creating a great country while conquering their own trials. The Winged Warrior, Benji, TJ, and the Champion Duo work together to solve problems in their own awesome ways.In this adventure, learn how Benji tames lightning! These characters’ traits have been exaggerated but they were just regular Americans like you and me. They simply found their callings and let nothing get in their way. They were everyday heroes, and you can be an everyday hero too! Share photos with your little patriots enjoying Founders Force on social media using #FF, #OriginalHero, and #FoundersForceKids for a chance to win an exclusive Founders Force gift! 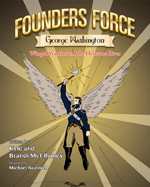 Founders Force George Washington: Winged Warrior and the Delaware River In this adventure, join Winged Warrior as he fights to free the colonies from the evil King! These characters’ traits have been exaggerated but they were just regular Americans like you and me. They simply found their callings and let nothing get in their way. They were everyday heroes, and you can be an everyday hero too! 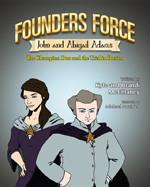 Founders Force John and Abigail Adams: The Champion Duo and the Trial in Boston In this adventure, join the Champion Duo as they fight to do the right thing! These characters’ traits have been exaggerated but they were just regular Americans like you and me. They simply found their callings and let nothing get in their way. They were everyday heroes, and you can be an everyday hero too! 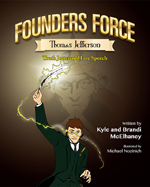 Founders Force Thomas Jefferson: Truth Jotter and Free Speech In this adventure, follow Truth Jotter on a quest to protect the freedom of speech! These characters’ traits have been exaggerated but they were just regular Americans like you and me. They simply found their callings and let nothing get in their way. They were everyday heroes, and you can be an everyday hero too! Go Bulldogs! 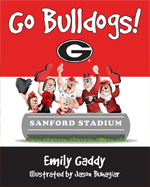 Ride along with a family of Bulldogs, study with the Student Bulldogs, and cheer on the Football Bulldogs as they get ready for the tailgate party and big football game. Have a laugh as the college girl asks, “Do you like my game day dress?” in this college game day story. 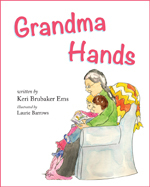 Grandma Hands Hands – what would we do without them? They rub, they scratch, they write, they wash, they do so many things for us every day. But Grandma hands are special, do you know what they do best? 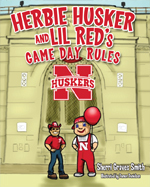 Herbie Husker and Lil Red’s Game Day Rules Come along with Herbie Husker and Lil Red as they take you through a game day filled with fun! Along the way, they will teach manners and good sportsmanship in the traditional University of Nebraska way! How Fredbird Became a Redbird Like all little birds, Fredbird dreamed of playing for the St. Louis Cardinals but in his first game things went terribly wrong. Then YA-HOO, something wonderful happened! This is the story of how Fredbird became a Redbird. 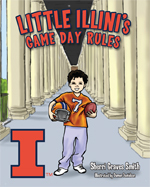 Little Illini’s Game Day Rules Come along with Little Illini as he takes you through a game day filled with fun! Along the way, Little Illini teaches manners and good sportsmanship in the traditional University of Illinois way! Maddie’s Me Bag Meet Maddie, a delightful girl with a SWEET secret. 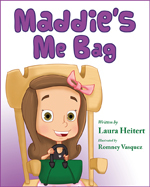 Maddie’s Me Bag is a story about a girl with diabetes. Through a classroom activity, Maddie teaches her classmates about tools and resources she uses to live a healthy, happy life. But diabetes isn’t the only thing that makes her special… What else does Maddie have in her Me Bag? A bird sings in the forest. A woodcutter follows the beautiful music and discovers The Mysterious Stream, which changes his life forever. Based on a traditional Korean folktale, this story is also available as an interactive book app in the Apple and Google Play Stores. 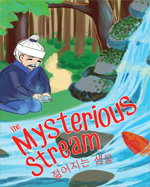 A bilingual teaching tool featuring audio narration in English and Korean, The Mysterious Stream App, entertains and educates. 숲 속에서 새소리가 들렸왔어요. 나무꾼은 그 아름다운 소리를 따라가다가 그의 운명을 바꿔놓게 될 젊어지는 샘물을 발견하였어요. 이 전래 동화는 애플과 구글 스토어에서도 구입하실 수 있습니다. 영어와 한국어로 되어 있는 젊어지는 샘물 앱은 재미있는 등장인물들이 나와서 아이들이 흥미롭게 이중언어를 배울 수 있도록 도와 줄 것입니다. Pistol Pete’s Game Day Rules Come along with Pistol Pete as he takes you through a game day filled with fun! 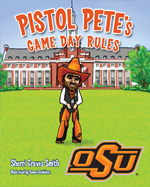 Along the way, Pistol Pete teaches manners and good sportsmanship in the traditional Oklahoma State University way! 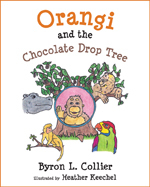 Orangi and the Chocolate Drop Tree Orangi was a happy, friendly orangutan that lived deep in the jungle. He loved sharing his secret chocolate drops with his friends. When the rain stops falling, the tree begins to die. What will Orangi and his friends do? 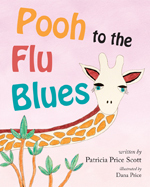 Pooh to the Flu Blues A giraffe with the flu Makes her public debut To affirm that when troubled, Your friends get you through. 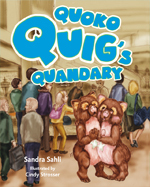 Quoko Quig’s Quandary Quoko Quig is off on another adventure, but he has a quandary. Will Stevie, Susie, and Sandy be able to help him in time? They all learn the importance of patience as they travel to a new and exciting part of the country! And, another Quig is on the way to help Quoko spread the message of love and kindness. 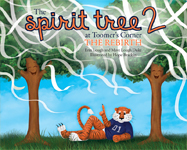 The Spirit Tree at Toomer’s Corner 2: The Rebirth This book was created to commemorate the planting of the new Auburn Oaks at Toomer’s Corner on Valentine’s Day 2015. The legacy will live on as the greatest tradition at Auburn University, where amazing memories will be made over many years to come! WAR EAGLE! 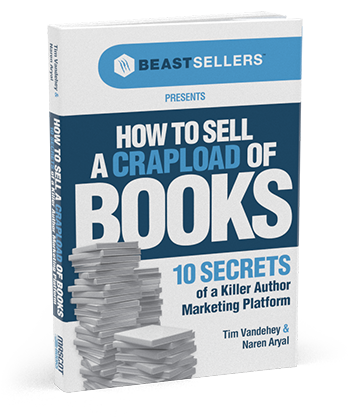 If you are a fan of this book, click here to check out the first one in the series!